Hero Characters: (Roster) Currently 69 characters are in Marvel Strike Force. Game Modes: Campaigns, Challenges, Events, Blitz, Arena, Alliance Wars and Raids. Alliances: Be social. Raid Together. Items/Supplies: Character Shards, XP Modules, Orbs. Gold, Power Cores, Materials, Gear. 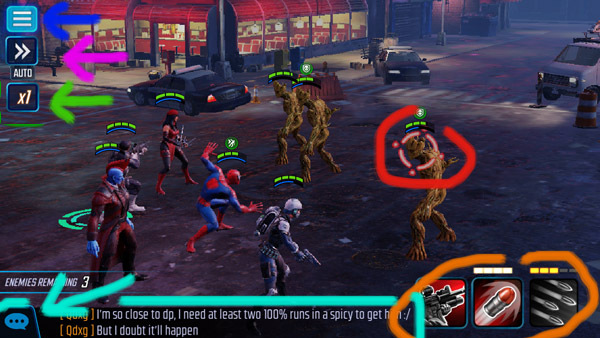 Marvel Strike Force plays like classic Turn based role playing games (RPGs). Decisions you make outside of battle are as important (if not more) than decisions you make in battle. The main goal of the game is to complete different stages and challenges by collect Marvel characters and leveling them up. To do so, this game requires knowledge, timing, and wise resource use. 1.2 Controls. Marvel Strike Force is currently only a touch screen game. So there are no buttons in use, instead we use icons. 1.3 Timing. However this goal is paced(timed) in a couple ways. Battles can only be done so many times until the are locked out for a certain time (on cooldown). Lightning Points/Energy is used to fight a battle, which regenerates over time. The total amount of energy that is allowed to regenerate can be raised by leveling up. 1.4 Resources. Balancing your time, supplies, and leveling is key to great game progression. Power cores should not be used to buy orbs, but energy. Energy reward XP and specific hero shards. Gold is plenty, but save it for leveling, and making purchases to complete objectives. There are seven different game modes in Marvel Strike Force. The first unlocked mode is Campaign, followed with Challenges and Events. 2.2 Campaign. The Heroes campaign is the first, followed by villains. Like most RPGs, Marvel Strike Force requires leveling characters and using proper roles to defeat the current stage. There are over 60 characters currently. Characters are part of three class types: heroes, villains, and minions. Also Heroes have a type. But no matter what character you choose, they cannot be too weak. 3.2 Leveling. Characters level with XP modules, gear upgrades, and character shards. But characters can only level up to your current profile level. You can get experience (XP) by beating missions to raise you player level. 3.3 Unlocking/Farming. Characters can be found by collecting shards by finishing mission and collecting rewards. Although there are certain characters that everyone seems to have, how you build your team also has much to do with luck. many rewards are random. Some character shards are given as specific rewards, such as Hulk for Achievements, or Wolverine for Daily Quests. Nebula: Heroes Assemble 4-9, The Nexus 1-3, Premium and Target Orbs. Orbs. Mostly used to find character shards, orbs can also help collect other primary resources. Orbs unlock items, gear, gold, training modules, shards, and ability materials. Orb collections change with events. Ability Orbs: at least 3 tiers of ability materials. Basic Orbs: Character Shards, gear and gold. Energy. There is campaign and raid energy, which allows you to participate in campaigns and raids. Energy replenishes over time. Also Campaign Energy is given free about 3 times a day. When your energy runs out, you can buy more with credits. If your credits are low, power cores can also be used. Although there are many options for building a team, a designated healer and tank (high health/defense) is recommended in practically every team comp. Some fights can be one with powerful damage. This makes it harder for 3 star ratings on campaigns though. Play daily objectives!, These give you experience, resources, and Wolverine. Don’t waste power cores! Many players agree on this tactic. Buying orbs with power cores is a waste of resources. Also, power cores are great back-ups for purchasing more campaign energy. Unlock Autowins for quick energy uses and farming materials. Autowin is unlocked by getting 3 stars on a campaign mission. How to get three stars? Get 3 stars by not letting any main team character die!